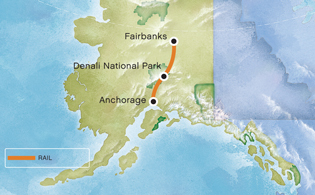 Travel aboard Alaska Railroad's Adventure Class service (picture window) from Fairbanks to Denali (upgrade available). Enjoy a morning at leisure or purchase an optional Natural History Tour of Denali National Park. Later, re-board the train and journey between the mountains of the spectacular Alaska and Talkeetna ranges on an incomparable sightseeing experience aboard luxury railcar. Take in the forests, mountains, rivers and valleys and cross the amazing engineering feat that appears at Hurricane Gulch where the train slows to 5 miles per hour to cross the trestle built over the creek 296 feet below—it’s a special thrill from out on the open-air viewing platform! Your vacation ends at the Anchorage railroad depot.